I’ve been working on my bad guy today. Is it true that in a mystery novel the author has to keep the villain a secret until the end? Not necessarily, because the villain isn’t always the killer, sometimes the villain is the victim. Witness Christie’s Murder On the Orient Express. When I write a mystery novel, I try to mix it up from book to book. Sometimes the bad guy is the killer, sometimes the victim, and sometimes the villain is just a red herring. Perhaps in a mystery novel, there doesn’t even have to be a villain, just a killer. A person can do an evil thing without necessarily being evil. No matter what kind of book, though, you can’t beat a great villain. The touch of genius in The Dark Knight’s Joker was that no reason for his evil was ever really given. The tale the Joker tells about himself keeps changing - is one version true or are they all lies? His most revealing explanation is when he compares his lust for destruction to a dog chasing a car. He doesn’t want anything. He wouldn’t know what to do with the car if he caught it. He just wants to chase it. We were speaking of our favorite villains. 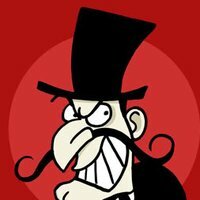 Remember Snidely Whiplash? Now there’s a villain.